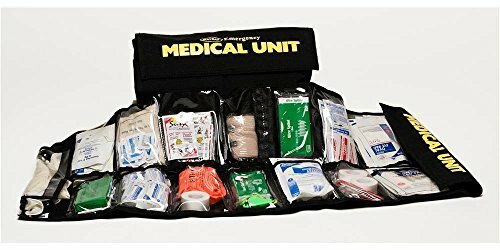 Includes one sleeve, CPR mouthpiece, tweezers, stethoscope, 3 ace bandage, bloodstopper, wire splint, triangular bandage, 5.5 bandage scissors, 10-pack ammonia inhalant, whistle with lanyard, two burn gel, two 5 x 9 in. combine dressings, three sun block, four 2 x 2 gauze pads, finger splints, four sterile eye pads, four 2 x 6 yards sterile gauze rolls, three 1 x 10 yd. adhesive tape, three pair latex gloves, six 3 x 3 and 4 x 4 gauze pads, six pain stoppers, six antibiotic ointments, six 3 in. x 1.5 in. knuckle bandages, ten large butterfly bandages, twelve antiseptic towelettes, twenty 1 x 3 band-aids. 5 in. L x 5 in. W x 12 in. H (2.5 lbs.). Includes one sleeve, CPR mouthpiece, tweezers, stethoscope, 3 ace bandage, bloodstopper, wire splint, triangular bandage, 5.5 bandage scissors, 10-pack ammonia inhalant, whistle with lanyard, two burn gel, two 5 x 9 in. combine dressings, three sun block, four 2 x 2 gauze pads, finger splints, four sterile eye pads, four 2 x 6 yards sterile gauze rolls, three 1 x 10 yd. adhesive tape, three pair latex gloves, six 3 x 3 and 4 x 4 gauze pads, six pain stoppers, six antibiotic ointments, six 3 in.